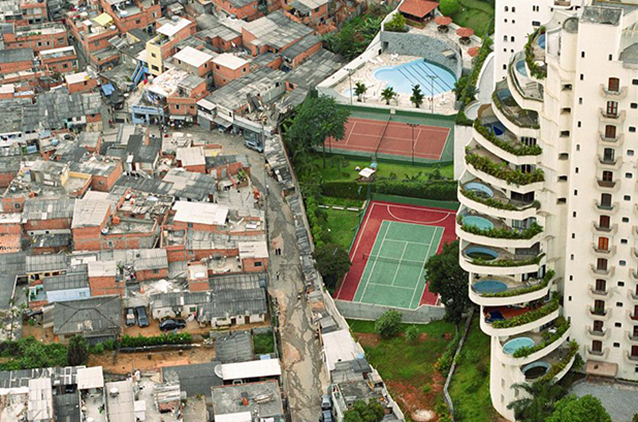 Favelas (slums) come together quickly due to the dire lack of housing in Brazil, mainly in large cities. Because of the housing deficit, thousands of extremely poor families in Brazil occupy empty or abandoned buildings or land plots. With the growth of real estate speculation, there have been many fires in very old slums, home to thousands of people. Such fires are capitalist crimes. It is widely known that large companies from the construction industry want to use those areas to build residential buildings or commercial buildings. Twenty or thirty years ago, slums that are now the targets of fires were in the low-value outskirts of town. However, over time, these areas became highly valued and large projects were developed around such slums by the civil construction sector. Brazil’s favelas often rest immediately on the border of expensive new developments, making them a target for real estate and construction companies. The vultures of civil construction then started to lust after the slum areas. They sent arsonists to set devastating fires that force the departure of the inhabitants. Many times the arsonist is an inhabitant of the slum, probably contracted to “do the dirty work” in exchange for some measly cash. The fire brigade sometimes says something like “a couple started quarreling during the evening and the man set fire to his house and the fire spread.” The authorities always say they will investigate and will report on who is to blame for the fire within in 30 days. But time goes by and they never report anything. The local government gives very little help to these unfortunate people who lose their shacks along with all their belongings. The officials in charge of the programs for ‘Popular Housing for Poor People’ offer the unfortunate people the opportunity to enroll in a popular housing program–municipal, state or federal. The tragedy in all this is that this affordable housing takes many years to be ready. Meanwhile all those who lost their homes are supposed to find a solution for themselves about where to live. Thus these people may come to live in places much further away. In most cases they just raid other abandoned areas or buildings and start another slum. The main movements in this struggle are the MTST (Homeless Workers Movement) and some others, a bit smaller, such as FLM (Front for the Housing Fight) and MNLM (National Movement for Housing Struggle). They are always ‘on the road’ struggling to survive. They are always very repressed by the police, and these movements take place very quickly. I would say this is a kind of war. Wilma Olmo Corrêa is an activist in São Paulo, Brazil. She participated in protests against transit fare increases and World Cup abuses. She is a member of the Brazilian PSTU (United Socialist Workers Party). A native Brazilian, she teaches English and translates for the website of the LIT (International Workers League).